UPDATE (September 2018): We’ve added a new section to discuss the upcoming Major League Baseball postseason. To jump to that section, click here. It’s playoff time in the NBA and NHL, which has drawn a huge amount of interest from SWIAM users in the last few months. Questions have come up about tickets for these games, so we thought it’d be best to explain a few of the unique quirks of playoff ticketing in major USA sports leagues as best we can. If you’ve spent any time looking through the Sports Where I Am database recently, you will have noticed how far into the future you can search for games. This is one of the key features of the SWIAM platform for helping travellers plan activities in advance of their overseas trips. You also might have noticed, though, a few games in a city’s schedule that made you do a double-take. Damn, the Washington Wizards made the NBA FINALS?! There’s a good chance these games won’t happen. A really good chance. 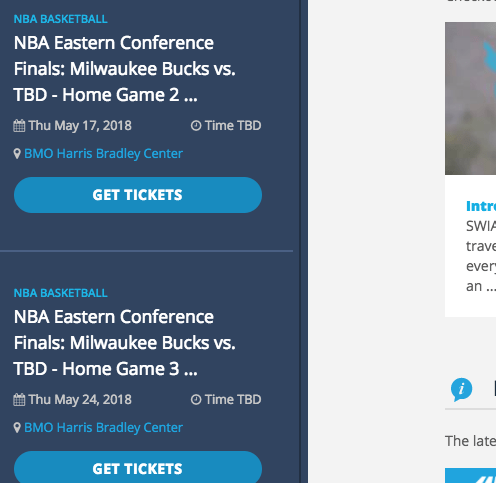 That’s right, you can currently buy Eastern Conference Finals tickets for the Milwaukee Bucks, who are – at the time of writing – down 0-2 in their first round series against the Boston Celtics. It’s unlikely the Milwaukee Bucks will make the Eastern Conference Finals in 2018, and even more unlikely that the Washington Wizards will make the NBA Finals… but it’s not an error. So why are these games listed on SWIAM? At the start of the postseason, teams release all home-game tickets to season-ticket holders as complete playoff packages. The clubs distribute tickets assuming that their teams will play in absolutely every home game possible – and they make tickets available for sale for them accordingly. We considered limiting the tickets that appear on Sports Where I Am until a playoff series has been confirmed, because we really don’t want any travellers to suddenly find out that a game they were expecting to attend isn’t happening. ■ A playoff series starts quickly after the previous one finishes – which could leave travellers with only a day or two to try to lock down a spot at these games. ■ You don’t have to keep checking the status of each series on top of planning your trip – you’ll have enough tabs open already – so it’s easier to plan when you have a clearer idea of the whole schedule. So what happens if I buy a ticket and the game doesn’t happen? Rest easy, Bucks fan – of course you will be refunded the cost of your ticket purchase if that game doesn’t eventuate. We have a 100% guarantee on all tickets sold through SWIAM anyway – so of course we’ll pay you back quickly if your game (and team) are scrubbed from the schedules earlier than you thought. The NBA and NHL playoffs are best-of-seven game contests, which can therefore result in a series running for seven total games, or ending after as few as four. Due to this, some schedules can be shifted around. As an example (see the screenshot above), if the Golden State Warriors were to progress to the Conference Semifinals after 4 games, and it took the New Orleans Pelicans, say, 6 games to win their Round 1 matchup, then the Warriors would have a few extra days rest to wait for the Pelicans in their (hypothetical) Semifinal matchup. If, however, both teams were to progress after just 4 games, then the next series (the Conference Semifinals) could start earlier, which could then impact the date/time of the current game listing on SWIAM. The time of games can also be shifted to accommodate for timing with other games on the same day or TV broadcast deals – so the potential for changes are something to be aware of when buying playoff tickets. We inform anyone buying tickets through SWIAM that the actual delivery date for tickets can be as late as 24 to 48 hours before the event starts. Sometimes, they’re ready immediately, which allows us to get your tickets to you months in advance, but it all depends on the event, team, and ticket type. With playoff tickets – and all of the aforementioned schedule shifting that can go with it – it’s probably more likely to be 24 or 48 hours before an event when the actual ticket delivery happens. It can cause some people to get anxious – particularly travellers, who want to tick things off their list. We get it. If it helps, we’ve been getting travellers to sporting events around the world since 2012, so we’ve seen every delivery method you can imagine. A city will come alive during the postseason. Unfortunately, though, ticket prices will probably also come alive – with the tickets in high demand, for obvious reasons. Travellers are particularly sceptical when it comes to paying “more than face value” for anything, and rightly so, but if the choice is between having tickets available at a price determined by demand or not being able to access any tickets at all – we’ll live with the system that at least gives us the option to get to the games. As always, if you have any questions or concerns about a ticket you’re looking at – contact us before purchasing and we’ll point you towards any value picks or discount codes we have running. At the time of this update, we’re about a week from the start of the MLB postseason. Once again, we’ve had some queries about the games listed on our site – perhaps even moreso as the format of the MLB postseason is different to some other sports leagues around the world. ■ For starters, in the MLB there are two ‘Leagues’: the American League and the National League. This is the equivalent of the “conferences” in other sporting codes like the NFL. ■ Within each League, there are 3 Divisions: East, Central, and West. Hence “AL East“, “NL West“, etc. that you’ve seen in the MLB Standings. ■ The team with the best record in each division qualifies for the postseason… but that only adds up to 6 teams, right? How do you create a postseason bracket with only 3 teams on either side? This brings us to Wildcard games. ■ For the 4th postseason spot in each league, the two teams with the best records in each of the National and American Leagues – who obviously haven’t already qualified for the postseason – play off in a Wildcard game. This is a one-off game where the winner takes the final spot in the postseason bracket. ■ Once the teams have been decided in both leagues, the first round of Division Series games are a best-of-5 series, followed by a best-of-7 League Championship Series, culminating in the best-of-7 World Series. Now you know about the format of the MLB postseason, you can scroll up to read our original post, as the points listed there apply for baseball games through October and November. Do you have other questions that weren’t covered here? Let us know all about it on our Facebook page.